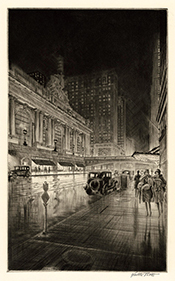 Grand Central, Night-- -c. 1920s, Drypoint. Edition not stated. Signed in pencil. Titled, and annotated 36.00 and the inventory number G2155 in pencil, in the bottom left sheet edge. Image size 12 7/8 x 7 7/8 inches (327 x 200 mm), sheet size 16 7/8 x 10 5/8 inches (429 x 270 mm). A superb, luminous impression, on cream wove paper, with full margins (1 3/8 to 2 1/2 inches), in excellent condition. 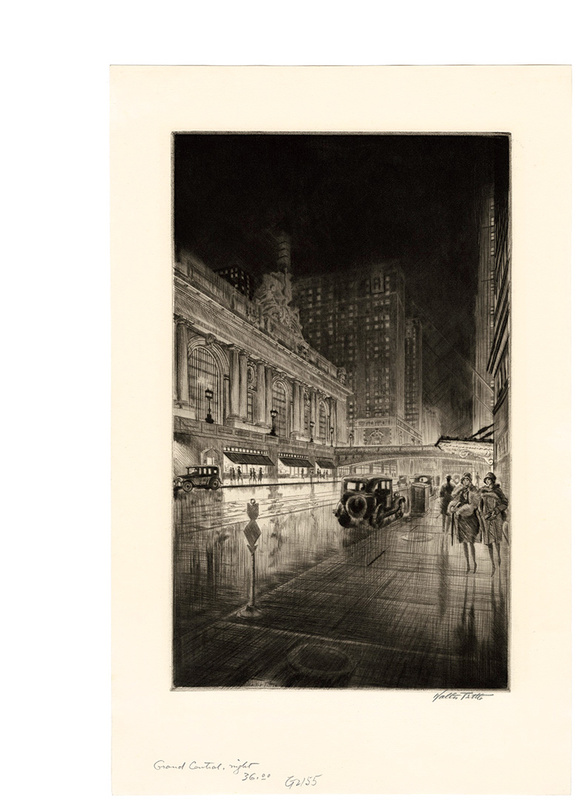 This evocative New York City nocturne depicts East 42nd Street, with Grand Central Station on the left. 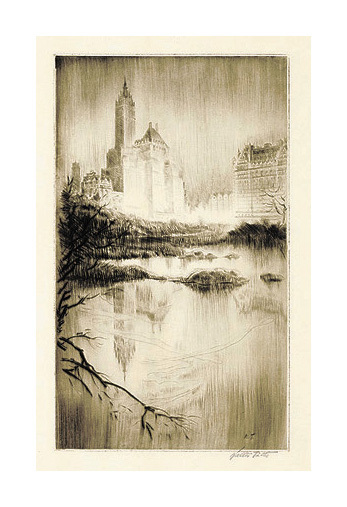 The Plaza, Sunset Glow -- -c. 1920s, Drypoint. Edition not stated. Signed in pencil and initialed in the plate, lower right. Titled in the bottom left sheet edge; annotated 5 in the bottom right sheet corner. Image size 11 3/4 x 6 15/16 inches (299 x 176 mm); sheet size 15 11/16 x 9 inches (399 x 229 mm). A superb, luminous impression in dark brown ink, with selectively wiped overall plate tone; on cream wove paper, with full margins (1 to 2 1/4 inches). Pale tape stains on the top sheet edge, well away from the image, otherwise in excellent condition. 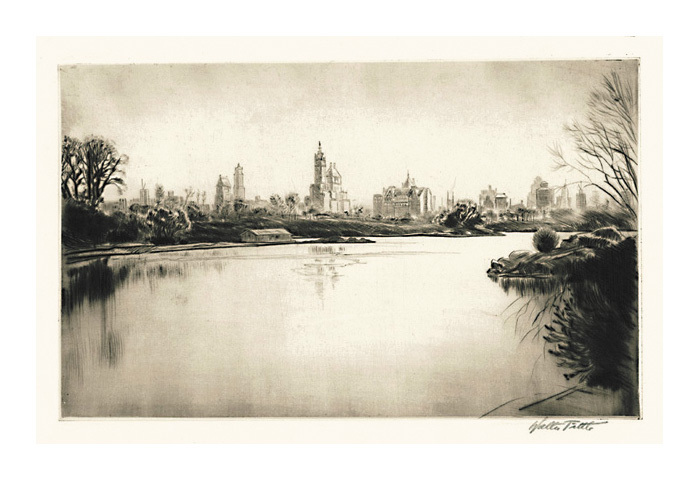 The Lake in Central Park-- -c. 1920s, Drypoint. Edition not stated. Signed in pencil. Titled Central Park and annotated No 169 in ink, in the bottom left sheet edge. Image size 6 x 10 inches (152 x 254 mm), sheet size 8 7/8 x 14 1/4 inches (225 x 362 mm). A superb, luminous impression, in warm black ink, on cream wove paper, with full margins (1 1/8 to 2 1/4 inches), in excellent condition.